A relatively inexpensive machine with superior styling, great customer service and a unique yogurt making option. 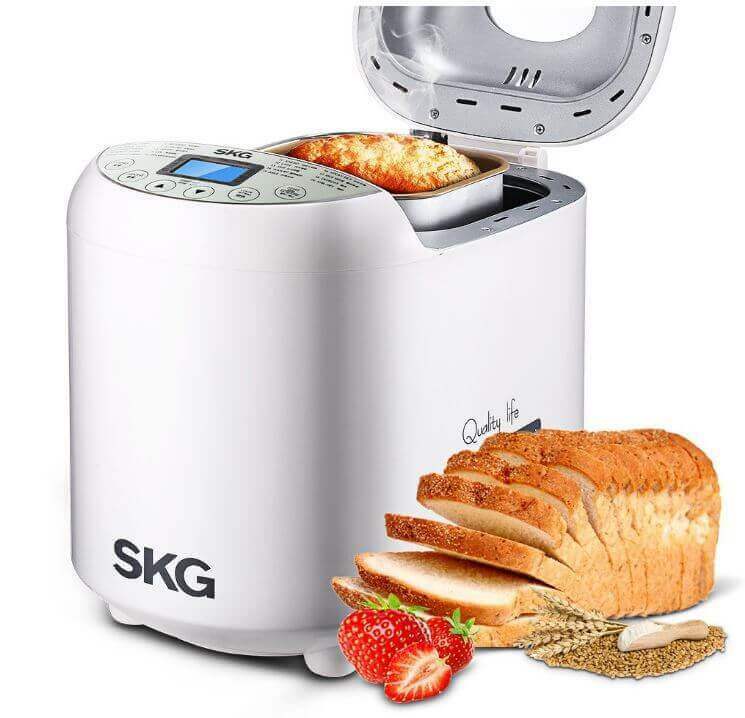 The SKG bread maker is a new entry in the bread machine category. It is a lightweight machine with a small footprint and a distinctive European style in its design. 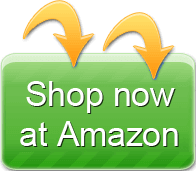 Overall reviews to date are extremely positive with 76% of current owners awarding it a 5-star rating on Amazon. The only minor pattern of complaints was related to the kneading paddle losing some of its non-stick coating over time, and some laments about the minimal recipes in the instruction manual. The price currently listed on Amazon.com is $97. 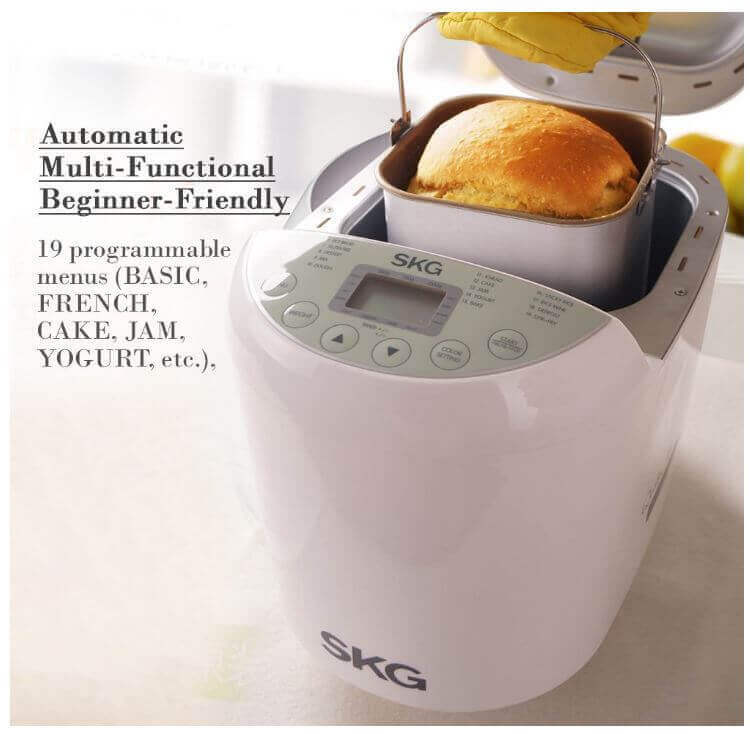 The SKG features 19 pre-programmed settings which is the most we’ve seen on any bread machine we’ve reviewed. Many of the settings are the standards like white-bread and dough settings, but it also features a gluten free and whole wheat setting in addition to a yogurt setting. That’s all I use this bread machine for. There’s a setting on it for GF bread. It turns out great! I use millet, sorghum, teff flours to make mine. Like many other machines you can make jams and jellies with the SKG, but this is the first time we’ve come across a yogurt setting. Hi. Yes, it does have that. After the dough kneads you’ll hear a beep. That is when you add in fruit, nuts, etc. 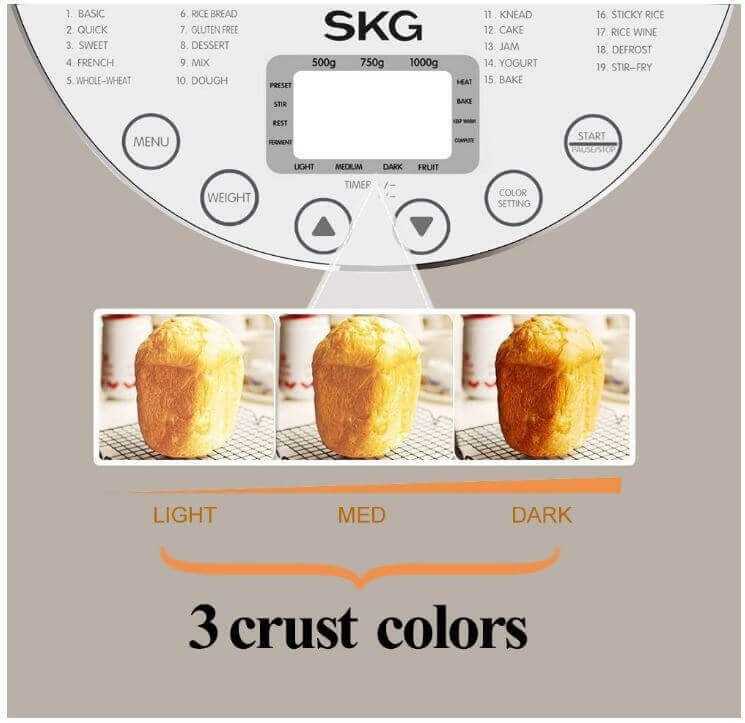 Like all bread machines it offers the option for 3 crust colors from light to medium to dark. It also has a 15-hour delay feature but never add dairy ingredients like milk, eggs or butter to a delayed cycle. Those ingredients will spoil quickly during a delayed cycle. The machine was also reported to operate quietly even during the kneading cycle. Quiet, versatile, and all around awesome! The bread pan bakes a traditional, vertical loaf and has a non-stick coating that is not identified. The machine is manufactured in China and all machines that we have investigated from China offer a Teflon or Teflon derivative as the non-stick coating. It has a single, fixed paddle and touts extra room around the bread pan to allow for more even baking. I love how the bread comes out. I’m giving it 2 stars because I’ve had it for 2 months and the paddle is already wearing out. The machine will bake a 1-pound, 1.5-pound and 2-pound loaf. There were a couple of complaints about 2-pound loaves rising too high. I have made two 2-pound loaves and each time, the bread has touched the window, once popping the lid entirely off. This high-rise can be a result of certain ingredients in some recipes, but this is a fairly compact machine and it may be more a function of the machine size rather than a recipe problem with 2-pound loaves. Customers have stated that the control panel is easy to use but there were minimal complaints about difficulty seeing the settings. The only reason I didn’t give it 5 stars is that the “settings window” can be difficult to read. This is a common lament due to the fact that few bread machines offer a backlit control screen. There are no programmable settings, but most owners seem satisfied with the variety of settings across the 19 pre-sets. Like most bread machines it has a viewing window in the lid but there is not an internal light that is offered on some of the more higher-priced machines we’ve reviewed. There was one complaint about the lid not closing properly unless carefully aligned, but it was the only complaint on this subject. The hinged lid has a good bit of float to it, so when you close the lid it often closes off-kilter and has to be repositioned. One of the biggest complaints we’ve seen across a range of bread machines is the quality of the instruction manual. SKG gets high marks for the clarity and directions in its manual but there is one limitation. It appears that they only offer one recipe for each one of the 19 settings and are fairly insistent that you only use the recipes in their book. Love the bread maker and all the different settings! Just wish the cook book that came with it had more recipes. You can download more recipes from the manufacturer and print them out, but some people prefer a manual that offers a bit more recipe variety from the outset. Instructions are very clear and user friendly. The machine measures 15″ x 13″ x 11″ and weighs 10.3 pounds. That’s rather light for a bread machine, but there were no complaints about the machine vibrating or “walking” on the counter during the kneading cycle. It also has what is described as “non-skid” feet so that may be a factor in machine stability. However, it does have a very tall profile and you’ll need a countertop with enough clearance below cabinets to easily lift the lid. The first thing I noticed and liked about this bread machine is its small size and footprint. SKG describes the color of the machine this way: “Sleek design and piano varnish in silver color.” Amazon.com describes the color as “white.” It also has a curious saying or slogan printed on the side of the machine that some people found to be a bit confusing. I do find the “Quality Life of Petty Bourgeois” emblazoned on the side to be weird. The SKG has a two-year limited warranty and lifetime customer service. Never happened to me. 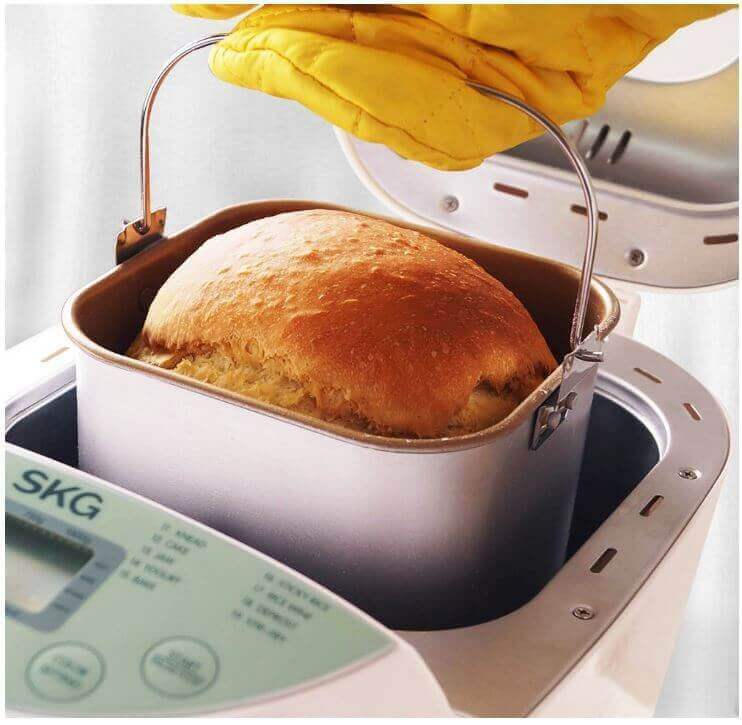 Though, this bread maker has a two-year warranty, so you should be covered. It’s customer service rating were very high and owners consistently mentioned how satisfied they were with the customer service department. The company is great with customer service. It appears that SKG has put together an interesting and high quality product. 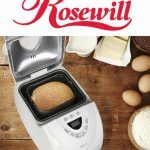 It has excellent customer service and the combination of its 19 pre-set programs and the yogurt option make it unique in the bread maker machine category. The limited number of recipes in the factory issued instruction book is offset by the additional recipes that can be retrieved from their website or via email. The only issue worth watching is the wear on the kneading blade which appears to have the same non-stick coating as the pan. If it is in fact Teflon or a Teflon derivative, flaking of the coating into a recipe is a problem. Hopefully it’s one they correct if it’s a chronic problem because the machine shows great promise for both amateur and serious bread makers. I’ve had my SKG Auto 2-lb’er for a year now and have been totally pleased with it. It is lighter, quieter and as capable of making the breads and dough I enjoy as the DAK my wife and I had used sporadically for more than 20 yrs. I now make a perfect loaf of bread almost every week, though I need to increase the amount of (active dry) yeast SKG recommends in their recipes I use, typically by 50%+. I like that the manual offers advice on recipe substitutions and on adapting recipes from other sources to SKG’s machine cycles. I’d buy it again. + PROS: Easy to use, versatile, fairly quiet, compact, affordable and, most importantly, bakes bread very well. The pan has a handle. The manual explains how to adapt others' recipes to the machine. - CONS: The display is not backlit. The baking pan is thin-walled for good heat distribution, so is easier to damage if dropped. Cycles and recipes are designed for active dry yeast only, so adjustments are needed should use of other yeast types be preferred. One needs to experiment with how much yeast to use with their recipes (but results are consistently repeatable). I’ve made a whole lot of bread over the years not using a bread maker. You MIST make sure your water is the right temperature (between 77 & 85 deg F, use a thermometer if you do not know what the water temp is) as low water or too hot water temp deactivates yeast. You must make sure you ACCURATELY measure ALL ingredients. I figured out all the grams, ounces, or fluid ounce weights (as I always use my kitchen scale to measure everything out….including the flour for super accurate measurements, and Amazon sells an inexpensive kitchen scale….weighing ingredients is superior to cups of this or that). If the bread is not rising to its fullest heights the problems can be: Water too hot or too cool, not enough yeast – add more yeast by 1/2 tsp increments. As I am using a high protein, lower gluten Antimo Caputo Italian bread/pastry flour which is a much lighter spring wheat (as opposed to the high protein, very high gluten, heavy winter wheat containing GMO [RoundUp Ready]) I need to use more flour (1/2 Cup more) than recipe book calls for and 1/2 tsp more yeast (I’m making a 2 lb loaf). Making these changes for me and the flour I’m using created a beautiful 2 lb loaf. So, looks like being familiar with bread making by hand is a plus otherwise you can experiment by adding slightly more flour or slightly more yeast. All yeast should be refrigerated always or it becomes unusable very quickly. I always keep my flour in the freezer for freshness and no bugs. 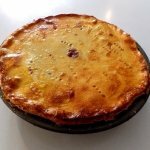 I buy my Antimo Caputo flour from Amazon and make everything with it including pie crusts and it works perfectly and I don’t get sick eating the products I produce from this flour (I’m gluten free) like I do with anything I make using American wheat. + PROS: Simple to use. - CONS: Tried the yogurt cycle and didn't work; i.e., all the milk leaked out of the bread maker onto counter. Have contacted SKG for help. 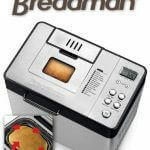 Just got my bread maker , very excited. The menu on the display never changed from 3:00 and a 1 not sure what’s going on, from watching the you tube video it seemed really simple. Pls advise me what to do next ingredients sitting in the machine. Where is a customer service number. The manufacturers website should have contact information including a support number. Just search the brand name for the machine on the internet and the website should show up as a search result. The manual emphasizes adding the ingredients to the bin OUTSIDE of the machine so this instruction video is very misleading on that front! I am making a bread with fruit and nuts. We never heard the beep when it was time to add the fruit and nuts. Can’t get the bread to rise enough, what should I add more or less of? Either let the bread rise longer or add an additional teaspoon of yeast and make sure you refrigerate your yeast. I have same issue! Any suggestions? - CONS: Tried 1.5 & 2 lbs loafs. Got all new ingredients and still bread is dense and halfway up. Any suggestions? Hola Tina, tengo una maquina muy parecida y lo que hago es al desmoldar queda a la vista la base del pan entonces alli colocas el gancho y retiras la paleta de amasar, facil!!! 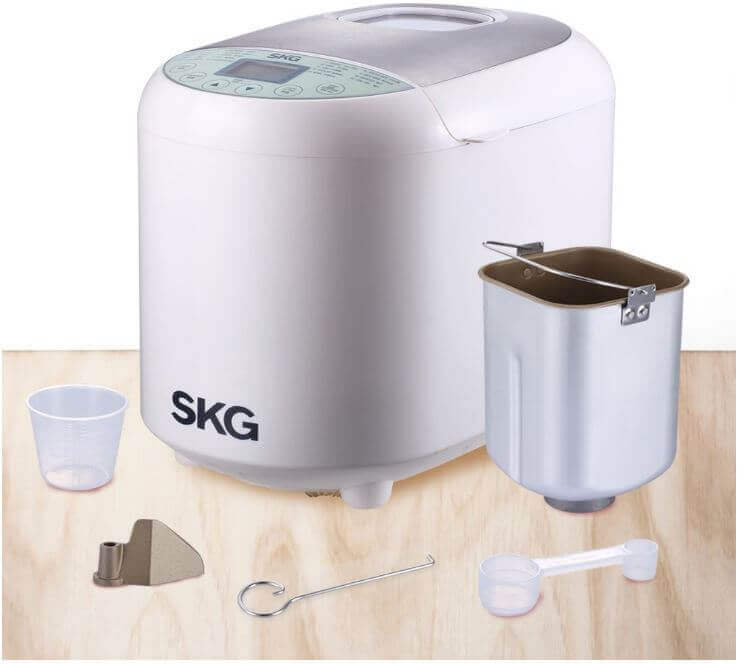 I just purchased my skg breadmaker and I don’t see anything in the manual about when to use the hook to remove the paddle and how to do it? Hello Tina, I have a very similar machine and what I do is to the desmoldar there stays at sight the base of the bread at the time there you place the hook and withdraw the palette of kneading, easily!!! Are you sure it’s even an option?